When my daughter was brand new in this world, small, red, wrinkly and (of course) the most beautiful baby ever, I looked into her eyes and melted. In that moment I decided that nothing bad would ever happen to her. I would be the perfect parent, come rain or shine. And I tried really, really hard to achieve this goal. I read every parenting book I could find, tried baby yoga and baby swimming… and always worried if I was doing the right thing. I stayed in constant judgement of myself to make sure I didn’t miss a beat in my quest to be the perfect mother. Then one night, I was trying to teach my daughter to sleep by using some kind of scream-a-certain-number-of-minutes technique that someone recommended. It was horrible! She screamed and screamed and screamed and I sat on the sofa and ignored her until the “right” number of minutes had passed. I went in quickly and left again. She kept screaming – with that tone of being completely lost and left alone, that breaks one’s heart. And I still didn’t go in until the “right” number of minutes had past – even though my whole being wanted, desired and demanded to. Then finally, I went in and she had thrown up in her bed from screaming. At that point something inside the very core of me said ENOUGH! Enough of listening to other people. Enough of trying to get it “right”. Enough of not following my knowing. That evening I chose something different. I chose to start following what I knew — and asked questions about what would work for me and my daughter. This was my first step towards conscious parenting – parenting based on including everything and judging nothing. So how does one do that? Well – there is no right and perfect way to parent consciously. That is the whole point! Conscious parenting is about what you know and what you would like to create with your child or children. It is an ongoing exploration and adventure. Most questions are actually statements with a question mark attached at the end. For example, as parents, we often ask our kids questions like: “Would you like to go to grandma’s?” when we really mean, “We’re going to grandma’s and you are coming.”. What if instead you would try asking real questions? Questions where you actually haven’t decided the answer already and are willing to look and honour the answer you receive? It is different, It is not how many of us have been taught to parent, and it can create a completely different world for both you and your children. We know what will work or not – even before we try it. And that knowing actually has nothing to do with thinking about it, discussing or rationalizstion it or trying to figure out the pros and cons of the situation. It is instant, we just know. And so do our children. My daughter, who is now 15 years old, is right on when it comes to what will work for her and me when it comes to visiting relatives, going to parties, travelling… She just knows. And now I listen. You will get things wrong. None of this is scientifically proven or has a set of fail-proof rules to follow. You will get awareness from what you choose and, sometimes, being wrong will create way more than being right. When you’re willing to say to your child – “sorry, I was totally wrong about all of that” – she or he learns that it is olay to make mistakes. They learn that they don’t have to be perfect! What if my story above does not mean that screaming techniques are awful, wrong and bad? It didn’t work for me, but it may work for you. If you judge it and put it in the drawer of things that are now “wrong and bad”, you’re off the path of conscious parenting again. What if you ask some questions instead, and follow your knowing. And even if you get it wrong, it is ok. You can choose something else. Remember, you don’t have to be perfect, and there is no such thing as the perfect parent. Katarina Wallentin is the co-author of the The Baby Unicorn Manifesto. 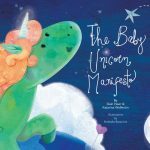 See GIVEAWAYS for your chance to WIN a copy of The Baby Unicorn Manifesto.